Tuteng, 2016-18. 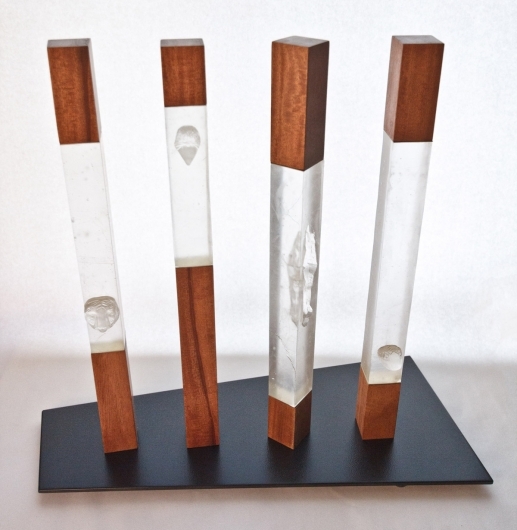 Kiln-cast glass, mahogany, brass and steel. 23″ w x 23″ h x 11″ d.
I spent many happy hours of my childhood digging up old coins and tiny glass bottles from neglected back lots, collecting empty snail shells, and cracking open sandstone rocks in search of fossils. My first dream was to become an archaeologist (an underwater archaeologist, specifically). I have taken a turn back towards these early roots in my recent artwork, captivated by the intertwined details of human and natural history. For over 6000 years, the Chinese have identified the four quadrants of the sky with animals — birds, dragons, snakes and tigers. 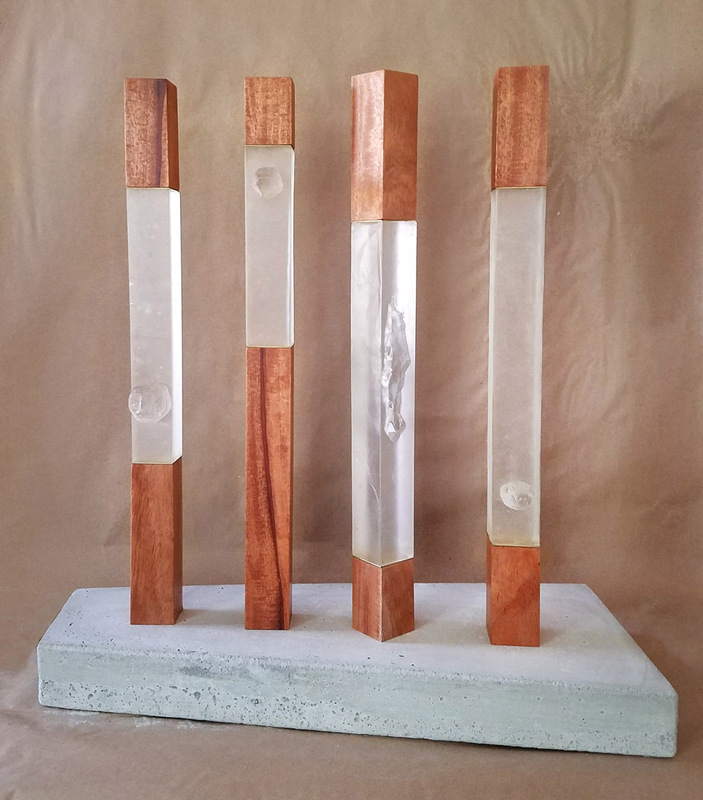 I first envisioned the Tuteng sculpture in 2015, as a series of five slim rectangular “totems”: one each for the four directions / animals, and a fifth representing humanity, which I decided to depict with a cave, or pit, filled with crystals. 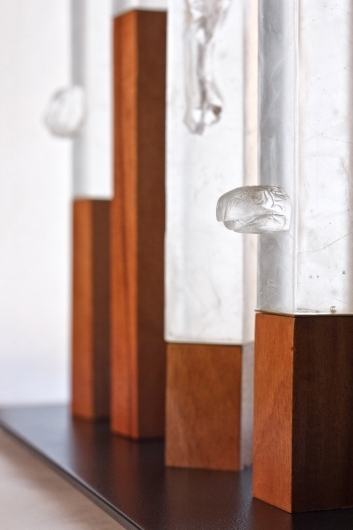 The original concept centered on the material beauty of natural mahogany and kiln-cast glass, highlighted by the simple and elegant form of each post. 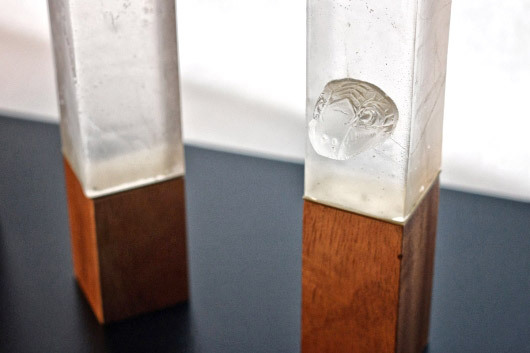 Glass and wood are joined by brass sheets that reflect yellow light into the translucent glass. While working on the technical and visual aspects of the project, I became curious to learn more about Chinese traditions and my own Chinese ancestry. I wondered if the Chinese had ever used totems. I found that the four symbolic animals featured in a groundbreaking archaeological discovery in 1986, one year after my birth to a Hakka Chinese mother and Caucasian father. Hundreds of artifacts from a highly sophisticated and previously unknown Bronze Age culture were discovered around modern-day Sichuan, a region with a large population of Hakka. The civilization thrived over 3000 years ago, an era so far back in Chinese history that much of our current knowledge is equal parts record and myth. These people, now known as the Sanxingdui, had developed an artistic style that was completely distinct and unknown in the history of Chinese art. Dozens of 8 ft. tall bronze masks and heads were discovered mounted on wooden supports, or totems, suggesting an impressive technical ability that was present nowhere else in the world at the time. Archaeologists believe that the culture willfully dismantled itself after their water source dried up following an earthquake. The majority of artifacts at the Sanxingdui site were found broken and buried in two pits. Hundreds of jade, bronze, and ivory treasures were piled in the pits as if they had been sacrificed. I had the idea for Tuteng before I knew anything about Sanxingdui. It’s been fun getting back into my first love of discovery. I worked on Tuteng each spring for the past three years. 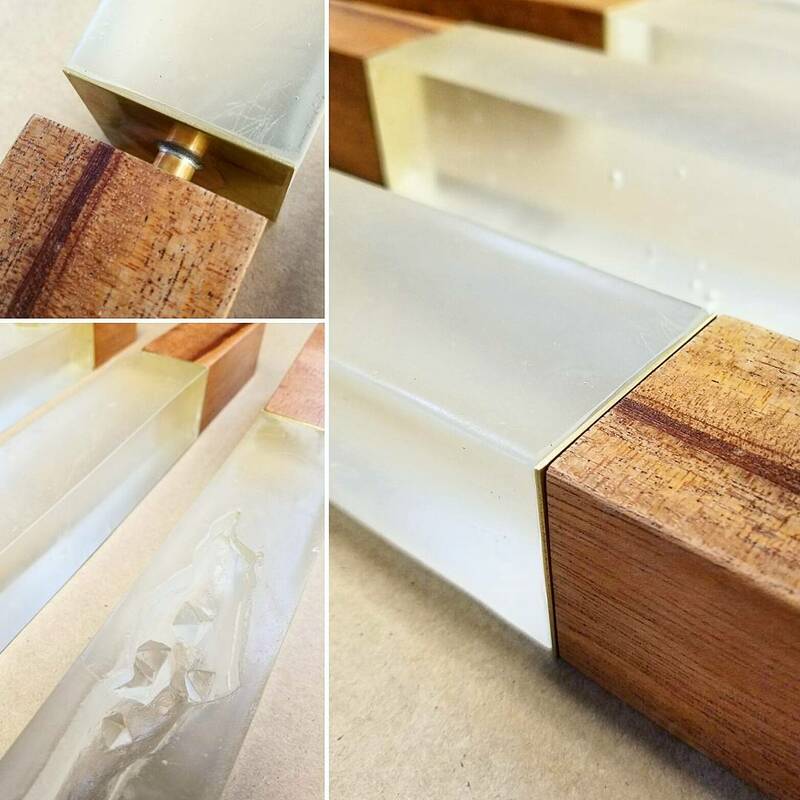 Spring of 2016 was spent casting the glass bars and sanding down the glass and wood to an equal size. 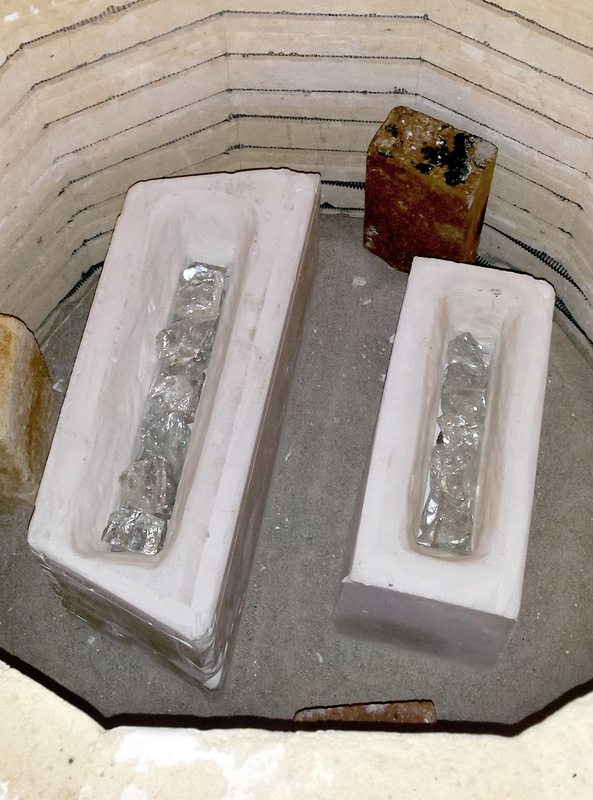 Left: plaster molds filled with glass chunks, ready for kiln-casting. 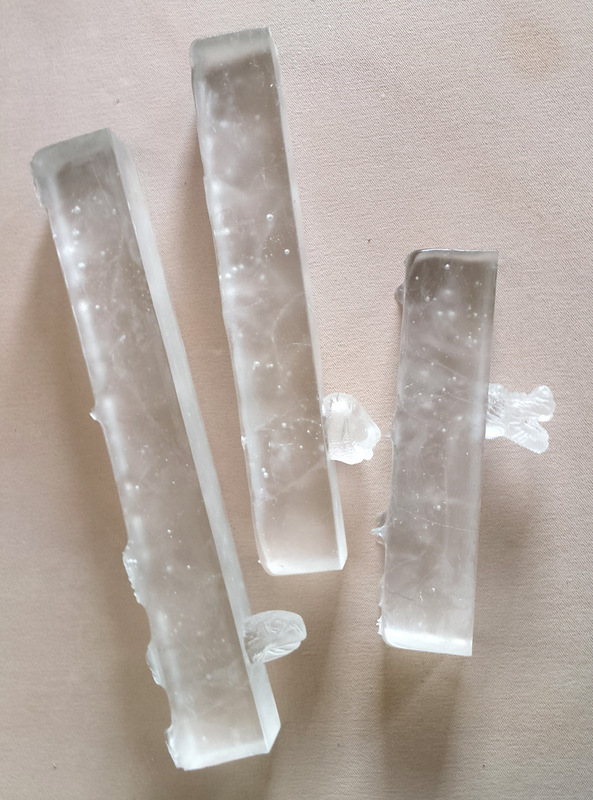 Right: Rough edges on glass bars fresh out of the kiln. I worked out the brass attachment system in spring 2017, accidentally shattering the dragon totem in the process. I spent a few months thinking about how to handle layout and spacing with four totems instead of five, and tested different materials and forms for the base. In Spring 2018 I found a local fabricator to create a custom steel base, and now the never-ending project is finally complete! Just in time for Chinese New Year. Gung hee fat choy! I thoroughly enjoyed this story and learning your process Em!! You rock the newsletter world!! 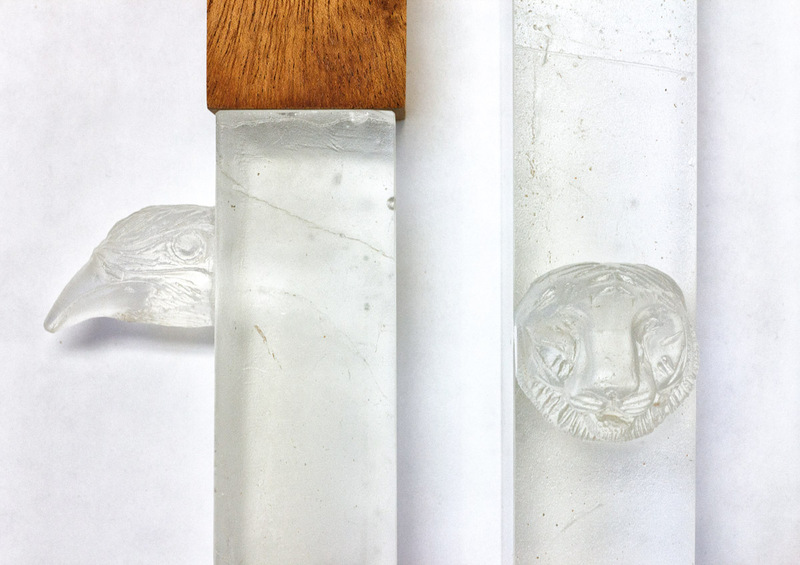 My question: where is the dragon glass piece? 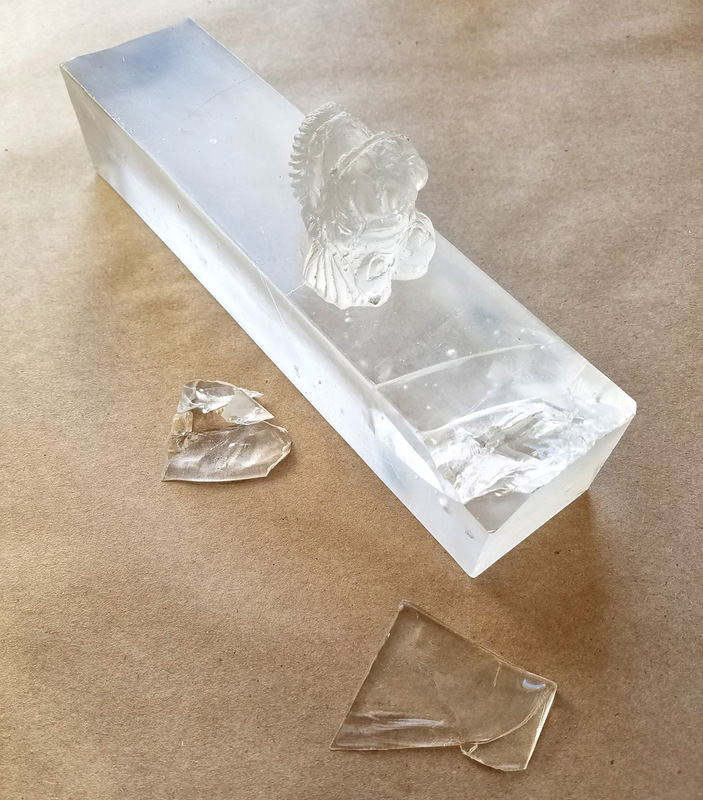 it looked like it wasn’t too badly damaged, a small sculpture perhaps? Thanks Helen! 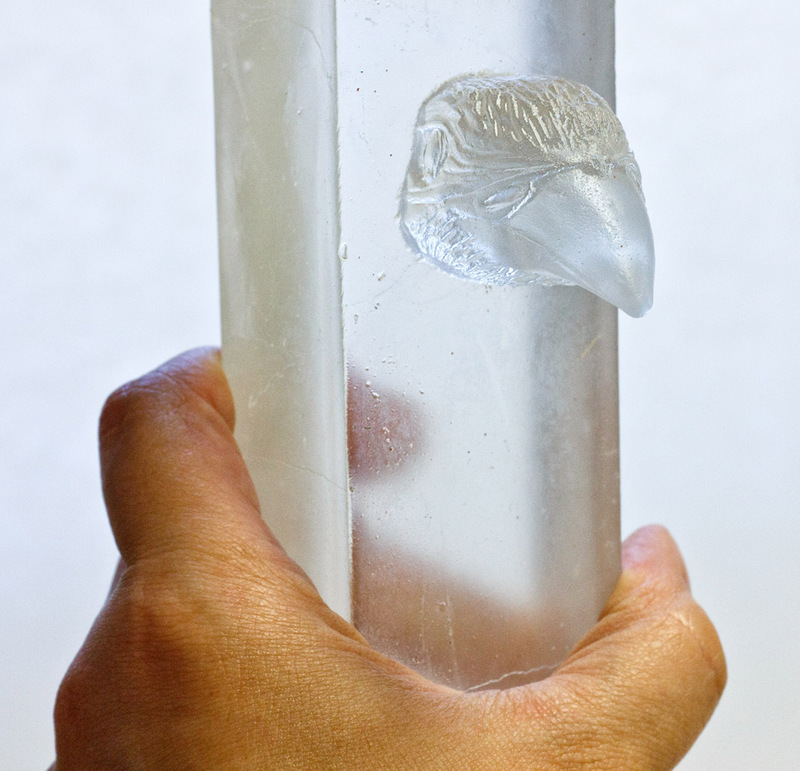 I still have the dragon totem, couldn’t bear to throw it out although there is a crack inside the glass that runs almost all the way down to the dragon head. It’s hard to see in the photo.